Barbacoa Beef starts with beef chuck roast cooked with perfect seasonings, and this Barbacoa Beef Dinner can cook in the Instant Pot or the Slow Cooker! Make this delicious low-carb beef for a perfect Taco Tuesday! Click for Slow Cooker or Instant Pot Mexican Shredded Beef, Chicken or Pork! 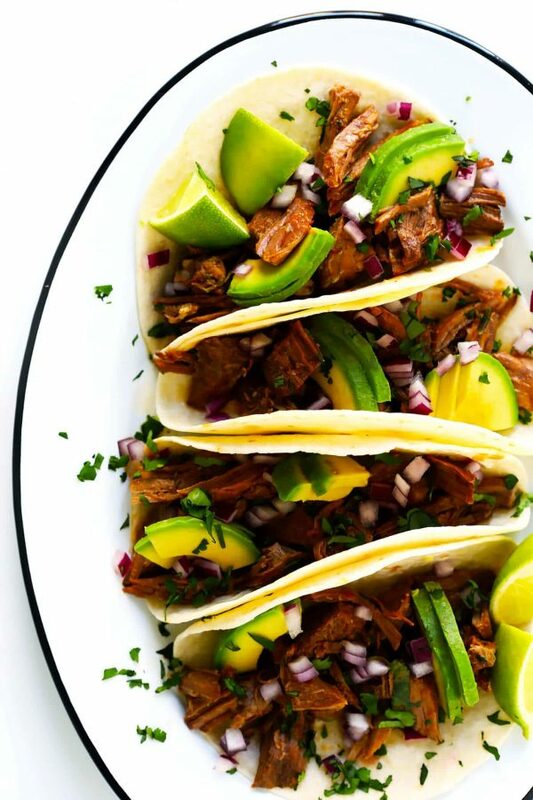 Click to see The BEST Instant Pot Barbacoa Beef Recipes! There’s something so wonderful about perfectly-seasoned beef that cooks quickly in the Instant Pot or simmers away in the slow cooker and then gets turned into a delicious dinner. I’m sure that’s why there are so many Instant Pot and slow cooker recipes for seasoned, shredded beef of every type, but this Barbacoa Beef from Gimme Some Oven sounds to me like a version of Barbacoa Beef that is not to be missed! Ali says you can use the tasty beef to make tacos, burritos, burrito bowls, enchiladas, quesadilla, tostadas, salads, or nachos! But since tomorrow is Taco Tuesday, we’re recommending you try that option first. There are so many of my favorite flavors here like lime juice, dried Mexican Oregano, garlic, and of course spicy Chipotle peppers; this just went on my “must try” list! And if you eat this delicious beef in low-carb tortillas or use lettuce wraps, this can be great for a low-carb meal! Chicken drumsticks are inexpensive and perfect for dinner any time of the year and here are The BEST Slow Cooker and Instant Pot Chicken Drumsticks Recipes. These chicken drumsticks will definitely please a crowd! PIN The Best Slow Cooker and Instant Pot Chicken Drumsticks Recipes! Chicken drumsticks are such a versatile ingredient, and they’re inexpensive, kid-friendly, and fun to eat for adults as well. And chicken drumsticks are perfect to make in both the slow cooker and the Instant Pot, so we visited food blogs around the web to find The BEST Slow Cooker or Instant Pot Chicken Drumsticks Recipes for you to try! And do you agree that when the weather starts to get warmer that recipes you can eat with your hands start to seem even more appealing? 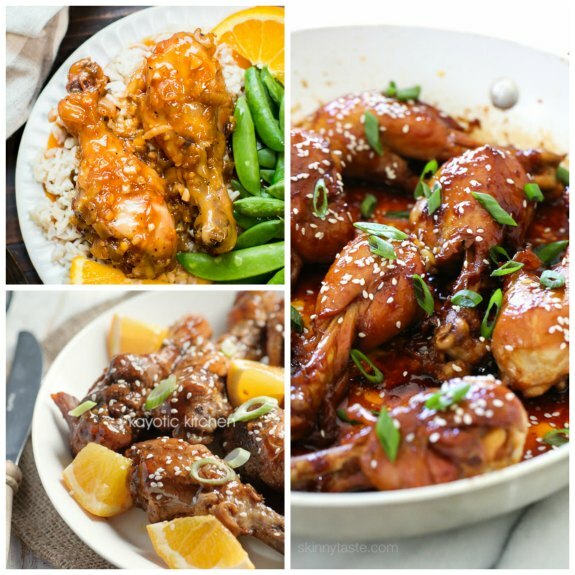 There are chicken drumsticks recipes with both sweet and savory flavors here, so there’s sure to be something your family will enjoy! Low-Carb Flank Steak Tacos with Spicy Mexican Slaw are a great idea for an easy low-carb Taco Tuesday dinner idea and don’t you agree that these tacos look delicious? This recipe can work for the Instant Pot or the slow cooker so everyone can choose the method they prefer! Click to see Fabulous Low-Carb Instant Pot Dinners with Beef! Flank Steak is a rich tasting cut of beef that is perfect for these Low-Carb Flank Steak Tacos with Spicy Mexican Slaw from Kalyn’s Kitchen. The flank steak gets tender and moist when cooked in the pressure cooker, and a bonus is the meat is cooked in a jiffy. Or you can let it cook all day in a slow cooker if you prefer that method! I love that this recipe is low-carb if you use low-carb tortillas or lettuce wraps for the spicy beef, but either way you eat it you will have a delicious tasting meal. Be sure to serve these tacos with the Spicy Mexican Slaw as it just finishes it off perfectly!